This is the first collection of key articles on the psychology behind educational attainment. It brings together in one volume for students a set of accessible but influential papers, representing the best classic and cutting edge work in the field. Charles Desforges is Professor of Education at the University of Exeter. 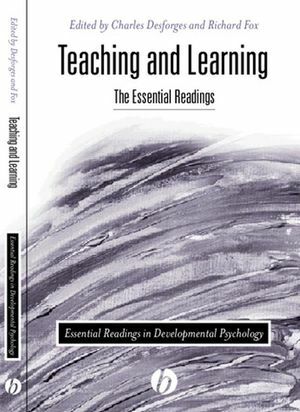 His previous books include An Introduction to Teaching (Blackwell, 1995). He has also been the Director of the ESRC Teaching and Learning Programme for the past three years, the largest education research programme ever funded in the UK. 1. Attaining Excellence Through Deliberate Practice: Insights from the Study of Expert Performance. (K. A. Ericsson). 2. Rhyme, Language and Children's Readering. (P. Bryant, M. Maclean and L. Bradley). 3. The Rebirth of Children's Learning. (R. Siegler). 4. Candy Selling and Math Learning. (G. B. Saxe). 5. Understanding Academic Performance at University. (N. J. Entwistle). 6. On Becoming a Tutor: Toward an Ontogenetic Model. (D. Wood, H. Wood, S. Ainsworth and C. O'Malley). 7. Teacher Expectation: Implications for School Improvement. (C. Rogers). 8. An Exploration of Long-Term Far-Transfer Effects Following an Extended Intervention Program in the High School Science Curriculum. (P. Adey and M. Shayer). 9. Reconstructing Context: the Conventionalization of Classroom Knowledge. (D. Edwards and N. Mercer). 10. The Role of Assessment in a Learning Culture. (L. A. Shepard). * First collection of essential readings on the psychology behind educational attainment. * Includes sufficient editorial material to help students gain an overview of the subject. * Offers an ideal starting point for the exploration of key topics in educational attainment.